Opera's Speed Dial is a set of visual bookmarks that gives you quick access to your favorite websites or dynamic, live extensions. 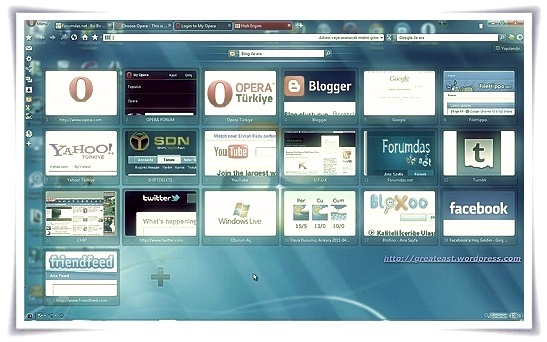 When you open a new tab in Opera, Speed Dial automatically displays. Just click the thumbnail of the page. Alternatively, in the address field, type the number that corresponds to the thumbnail position and press Enter. - Click the star that appears to the right of the address field and select Add to Speed Dial. 1. Select the Speed Dial button, shown by a "+" symbol, and either select one of the suggested websites, or enter a web address (URL) in the Address field. Suggestions are based on frequently visited or currently open webpages. 2. Enter a name to help you to easily identify it. An extension in your Speed Dial can show live, animated content, such as news feeds, the weather, or even a collection of your favorite photos. 1. Select the Speed Dial button, shown by a "+" symbol, and either select a suggested extension, or click View all Extensions to select one from the catalog. 2. If you want to control the interaction of the extension with secure pages or private tabs, click Privacy and select the desired settings. 3. Click Install to add the extension. It's added and shown as a dynamic thumbnail. For some extensions, you may be asked to set some preferences. Right-click the thumbnail and select Edit. Select from the suggested websites, or enter a web address in the Address field. Enter a name in the Name field to help you identify it. - Select the cross in the lower-right corner. - Alternatively, right-click it and select Delete. - Drag-and-drop cells from one space to another. 1. Select Configure at the top-right of the window. 2. In the Zoom Control field, select Manual from the drop-down list. 3. In the Zoom Level section, use the zoom slider to set the desired level. - Reload a single cell by right-clicking it and selecting Reload. - Reload all cells by select the Reload button on the address bar. - Set automatic reload at a specified interval, for example, for a news site, by right-clicking the cell and selecting Reload every. Select the time interval from the list. Display the drop-down menu from the search field and select Manage Search Engines. Select the search engine or website you want to use, click Edit, then Details. Check the option Use as Speed Dial search engine, then click OK.
1. Display Speed Dial and select Configure at the top-right of the window. 2. Check Custom background image. 3. Choose how you want to display the background image from Best fit, Center, Stretch, or Tile. 4. Select Choose and locate the image you want to use. If you want to save space and remove the Speed Dial button, marked with a plus symbol, select Configure at the top-right of the window and uncheck Hide [+] Speed Dial button. To add a new cell once this is removed, right-click in a blank part of the Speed Dial and select Add New Dial. If you want a blank page to automatically display in a new tab rather than Speed Dial, you can delete all the individual dials, hide the "+" Speed Dial button as outlined above, and remove the search field in Manage Search Engines. Alternatively, type opera:config in the address field, find the option for Speed Dial State and change the number to 3. You may need to restart the browser for changes to take effect. An alternative way of displaying the Speed Dial Configure dialog is to right-click in a blank part of the Speed Dial.